A. Junk food is everywhere and continuously tempting in airports. There are so many opportunities to make unhelpful food choices, especially when I “see” food but am not actually hungry. 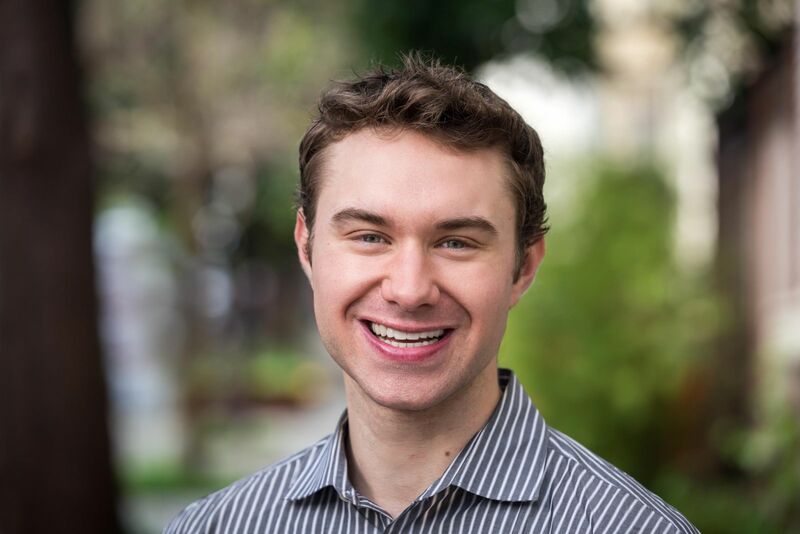 B. I’m more likely to be sleep deprived and stressed while traveling, which drive insulin resistance, sugar/carb cravings, and worse food choices. If I fall into such choices when I’m not even hungry, high blood sugars are almost guaranteed. 2. I can avoid Diabetes Landmines with a pre-loaded plan of attack. How can I set up a Bright Spot choice instead? No matter the food environment I find myself in, I can usually change my default options by thinking ahead. Travel does bring a lot of uncertainty, but much of it is actually quite predictable – I know what restaurants and snack options will be in my nearby airport, I know I’ll be able to access my carry-on bag, etc. With those ground rules in mind, here are six tools I use to eat in airports and on planes! 1. I rely on nuts and seeds while traveling – almonds, peanuts, pumpkin seeds (in the shell), sunflower seed (shelled kernels), etc. These are readily available in pretty much every airport convenience store around the world. They are also portable, don’t spoil, and pack well. If I plan ahead, I stock up on bags at Trader Joe’s and bring them with me in a carry-on suitcase. I generally take 1 unit of insulin right as I start eating, with minimal resulting impact on blood sugar. (Cashews are an exception, as they still pack a lot of carbs. I steer away from them.) If buying nuts or seeds in an airport, make sure they are not “glazed” or otherwise covered in sugar. 2. I pack chia pudding supplies in a large Ziploc bag, and then I make it on-the-go in this Sistema breakfast bowl+spoon to-go container ($8). 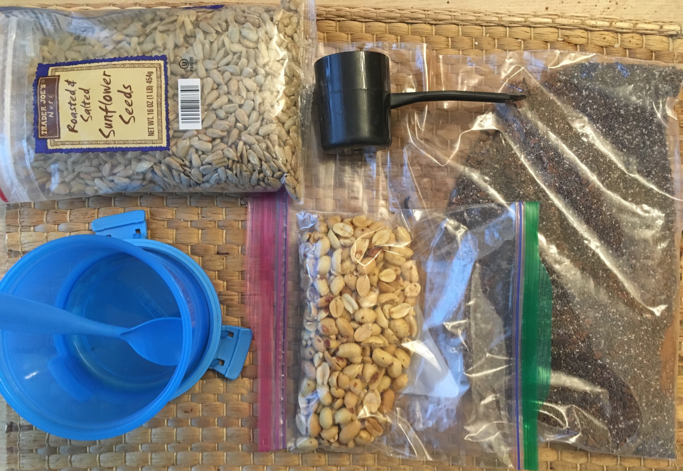 When I’m packing for a trip now, I pre-mix: 1 cup of chia seeds, a hearty amount of cinnamon, 4 tbsp of cacao nibs, and 4 tbsp of unsweetened shredded coconut flakes in one big Ziploc bag, along with a ¼ cup single-serving scooper. When I want to eat, I mix ¼ cup of the chia mix with ½ cup of water on the go. I stir it for a minute or two, and then top it with the aforementioned nuts and seeds. Relative to my at-home recipe, the two ingredients I omit in the travel chia pudding are berries and coconut oil. Still, this works great as portable, filling, predictable diabetes snack or breakfast that can be made anywhere I have access to water. 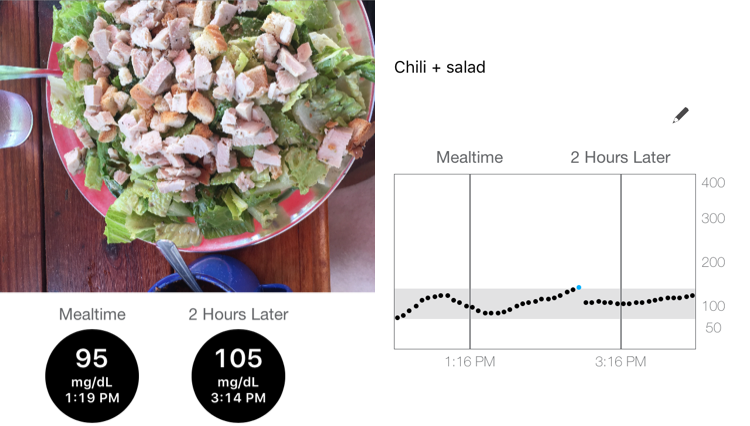 Here’s a CGM trace on a recent intermittent fasting day spent on an airplane to Chicago. This was after five hours of sleep and without my usual morning activity. I had coffee and tea in the morning, with my first meal of the day at 1:15 pm. I spent 95% of the day in my target range of 70-140 mg/dl, with an average glucose of 111 mg/dl. This is far better than my typical averages. I needed just 29 units of insulin, about 20%-30% less than I typically use. Salads with chicken and dressing of choice (Caesar or Olive Oil/Vinegar). I avoid dried fruit, croutons, and crunchy tortilla strips. Sashimi and miso soup at Japanese places. Chili is an option at soup places (with or without meat). It increases blood glucose more than the options above, but less than most airport options. 6. Quest Bar protein bars are often sold in airport convenience stores and are a useful low glycemic option to mix things up. 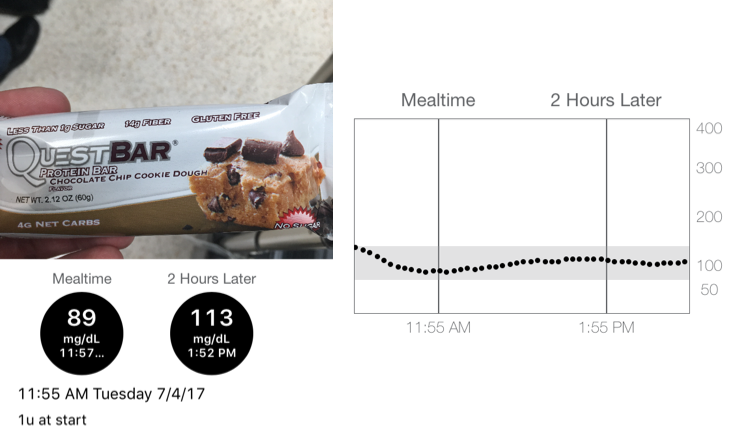 Unlike most sugar-laden “protein bars,” Quest Bars have no added sugar and roughly 70% of the carbs are from fiber, translating to little impact on blood glucose. However, they do have a sweet taste (from erythritol, sucralose, and stevia), which does make them easy to overeat – I try to have only one bar on my person at a time. If you can’t find Quest Bars in your airport convenience store, they are available online and in most grocery stores. I tend to over-snack on these as a “treat” at home, so I only buy them individually when I’m out. Get more food tips in Chapter 1 of Bright Spots & Landmines: The Diabetes Guide I Wish Someone Had Handed Me. It’s available here as a free/name-your-own-price PDF download, here in paperback ($6), and here on Kindle ($1.99). Is this Q&A format helpful? Do you have other questions? Let me know – I’m always looking for column ideas. Plus, another diaTribe reader might have the same question as you! All of Us Program Reaches 110,000 Participants – What’s Next?